RECEIVER HEADS FOR AUTOMATIC SCREWDRIVERS, PNEUMATIC AND ELECTRIC TOOLED TO ACCEPT FASTENERS FROM STAINLESS STEEL AND POLYCAST VIBRATORY PARTS FEEDER BOWLS. MCI/Screwdriver fixtured receiver head mechanisms are avaiable with either a 6� or 8� stroke. They are capable of producing as much as 80 lbs of thrust standard. 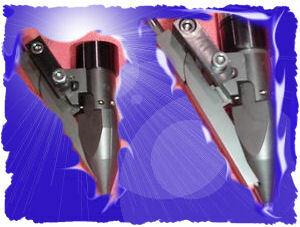 These automatic screwdiver and nutrunner receivers are very compact (Approximately three inches wide). As a standard in all nut runners and automatic screwdriver receiver heads we provide upper and lower stroke limit sensors standard (24vDC) along with shock absorbers at all impact points. We would be pleased to submit a quotation on a package that meets your automatic screwdriving requirements. Please contact one of our consultants by E-mail, or call us at 317-776-1970. 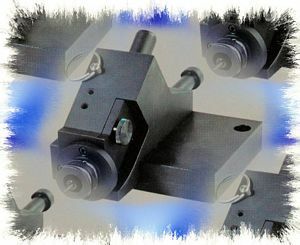 Our high quality receiver heads are also availble in our unique Lean Manufacturing Cell Work Stations. Our unique design allows for an adjustable stroke length and jaw stop position. Flow controls are provided as standard, utalizing dual sets on rear mounting patterns as a standard. Each Receiver Head Device for our automatic scredrivers and nut runners are designed to accomodate standard high load bearings and utilizing standard cylinder mounting for easy regional replacement. 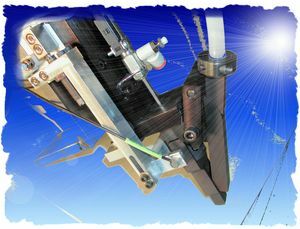 We place a high degree of importance on keeping our receiver head designs simple for easy for maintenance. The Weights of our standard Automatic Screwdriver and and nut runer receiver mechansims is approximately 8 pounds or less (without tool). Our unique design also provides for the tool of your choice to be utilized. Our standard quick release receiver heads are also used in the design of all of our automatic screwdriver systems for manual, semi-automatic or fully automated screw driving applications. We also offer Polycast� vibratory feeder bowls, stainless steel vibratory feeder bowls, insertion equipment, machine station tooling and in-house refurbishing, upgrading and re-manufacturing of any existing screw driving systems. With our unique and custom design capabilities, manufacturing expertise, and stringent quality control standards you can rest assured that there is no need to look elsewhere for bits and pieces of a system. From concept to completed system, MCI will provide you with a system of the highest quality within your required timeframe and budgetary guidelines. We have immediate availability of replacement parts in stock for every system we provide and for many of our competitors screw driving systems.